1. A ball is thrown up into the air. 2. A ball is thrown up into the air. 5. 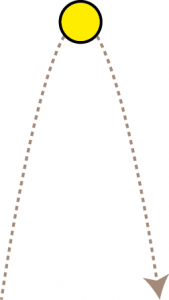 A human cannonball is fired at a speed of 25 m/s at an angle of 50°. What is the maximum height that he reaches? 6. 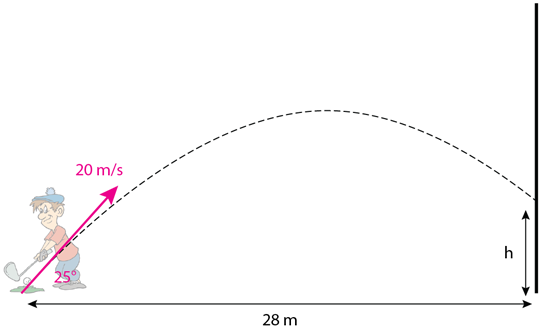 A human cannonball is fired at a speed of 25 m/s at an angle of 50° and lands at the same height as launch. How long is he in the air for? 7. A human cannonball is fired at a speed of 25 m/s at an angle of 50° and lands at the same height as launch. What is horizontal distance that he travels? 8. 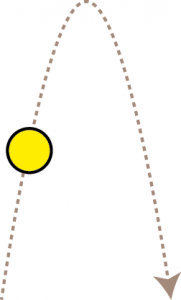 A ball is kicked horizontally at a speed of 10 m/s off a 15 m high embankment to the ground below. At what angle does the ball hit the ground? 9. 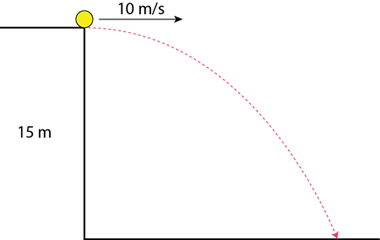 A ball is kicked horizontally at a speed of 10 m/s off a 15 m high embankment to the ground below. At what speed does the ball hit the ground? 10. 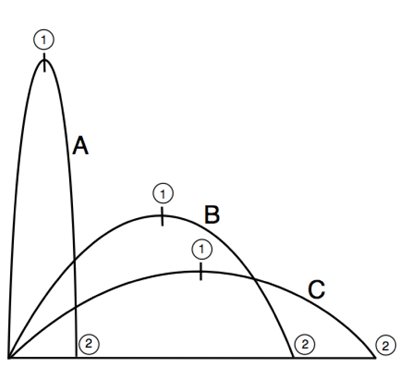 A golfer hits a ball at speed of 20m/s at angle of 25° above the horizontal. The ball heads towards a fence 28m away. At what height does the ball hit the fence? This entry was posted in How do things move without contact?, Quiz, Unit 3 Quiz and tagged Motion, Projectile Motion, Quiz. Bookmark the permalink.